On a Saturday morning in February, Dixie Landers, friends and families of Lowcountry blind youth gathered at Charleston’s AMF Lanes on Savannah Hwy. 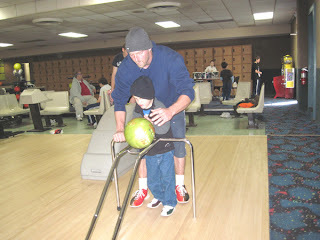 for the first of ten weeks of bowling! This unique and wonderful outreach was introduced by Peggy Sudol, one of our sighted members who is also an active team member of Dragon Boat Charleston. 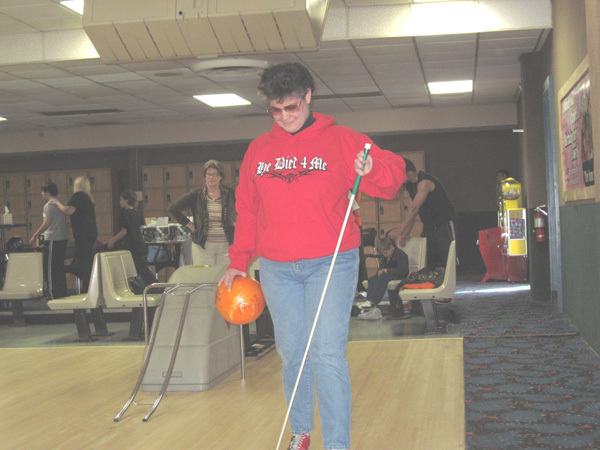 DBC enjoys bowling on their off-season and this year, the team voted to sponsor a league which would represent the blindness community. It was agreed that this league would be inclusive rather than exclusive. 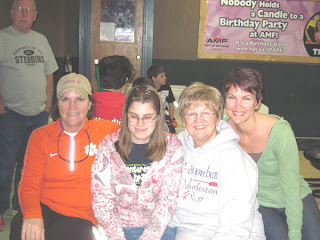 We encouraged blind participants young and old to bring sighted family members for an outing of fun and fellowship! 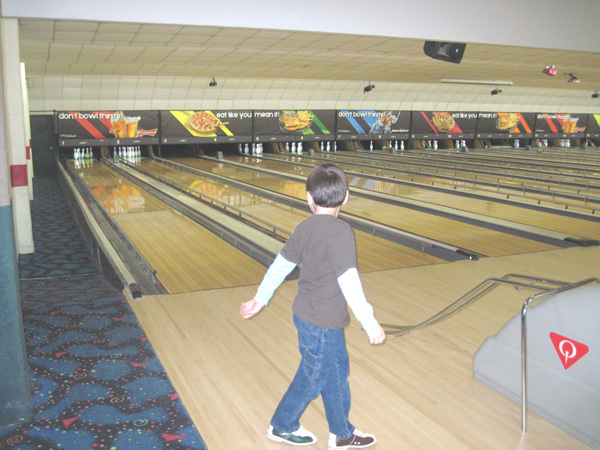 Bowlers ranged in age from seven to seventy-five. Dragon Boat Charleston, AMF Lanes and Dixie Land GDU worked together to provide free games, ball and shoe rental for up to 15 people each week. 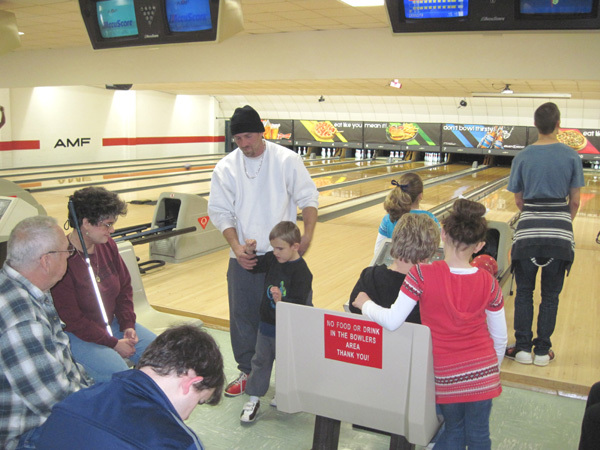 The ten-week bowling outing began and ended with a pizza party, and as a special treat, DBC provided participants with complimentary custom-fitted bowling balls (and bags) for keeps! Our youngest bowlers were seven and eight years old. Eight-year-old Blaze (who is sighted) enjoyed perfecting his skills on the lanes. Meanwhile, seven-year-old Dalton’s dad, David, introduced his son to the game, made accessible to him by bumpers and a bowling ramp (the rail seen in front of him in the picture). Our Secretary/Treasurer, Laurel Jean, used Slim (her long, white cane) to line up with the lane in front of her. Laurel has the unique ability to score a gutter ball even with the bumpers up! In February, Dixie Land hosted and sponsored a picnic at James Island County Park with food, fellowship and fun for all ages. Thanks again to Peter Smith and the Charleston Fliers who made this picnic day extra special with tandem bike rides for everyone! 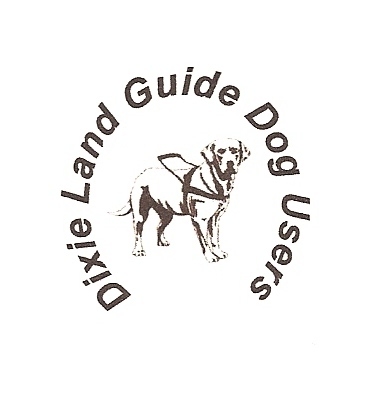 Our bowling outing and picnic were so successful that Dixie Land Guide Dog Users, Inc. is proud to announce our latest initiative, “Keeping Families Focused.” We know firsthand that blindness affects the entire family. Our goal in creating this initiative is to offer more activities which include everyone and keep families focused on the core unit of the family, rather than the disability of just one member. Thanks also to other sponsors, Retina Consultants of Charleston and The Association for the Blind of South Carolina, we have already scheduled our first official outing, a very unique “hands-on” art exhibit and workshop. Stay tune for more posts, and thanks for your ongoing support. Hot Dog! It's Top Dog!